WEST GEORGIA VS CATAWBA Reviewed by Webmaster on September 10, 2018 . The Wolves came into Saturday’s game with high expectations and a lot of returning starters for a high caliber offense. 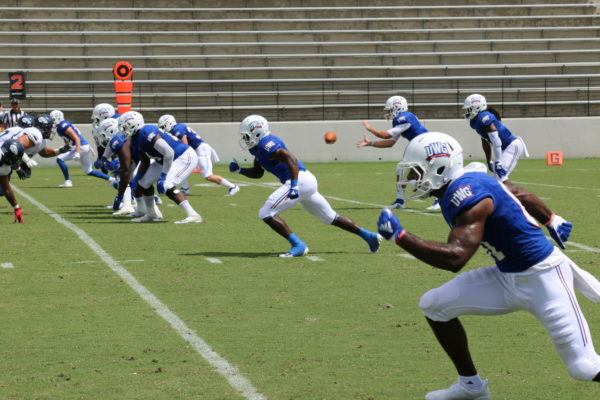 Willie Candler returned for his Junior season as the starter at quarterback alongside All Gulf South Conference Team Senior running back Devontae Jackson. A lot of firepower came with a lot of high expectations, but the Wolves met those expectations with a solid victory against Catawba. The Wolves started off very slow to start the game, and after a missed field goal found themselves down 3-0 to end the first quarter. Willie Candler eventually found the end zone with a strike to Malik Henry to help the Wolves take a 7-3 lead into the half. UWG found their stride in the second half as Devontae Jackson rushed for an 8 yard touchdown, but the extra point was missed. Willie Candler found Tevin Isom early in the fourth quarter for a 4 yard touchdown, giving the Wolves a 20-3 lead. Catawba was forced to punt in the next possession but K.J. Palmer returned the punt 62 yard for another West Georgia Touchdown, 27-3. The finishing touch came in the last 50 seconds as Sam Ndem rushed for a 20 yard touchdown give the Wolves a 34-3, Final. The defense is where it’s supposed to be, picking up 3 turnovers (1 fumble recovery, 2 interceptions) as well as 3 sacks. The Wolves held Catawba to 195 yard of total offense. Even though they scored 27 points, the offense still seems to struggle in the red zone, something that plagued them last year. The Wolves were 4 of 8 in the red zone. Kicking seems like something that the Wolves just can’t figure out, last year the Wolves were 10 – 17 in Field Goals; to start their 2018 campaign they are 0-3 and a missed PAT. The Wolves will be at home again on Saturday, September 8th against Limestone. The game will start at 2 PM. Nick is The WOLF's Sports Promotions Director. See more of his content on our social media @thewolfsports. Next article Blog UWG vs Limestone.